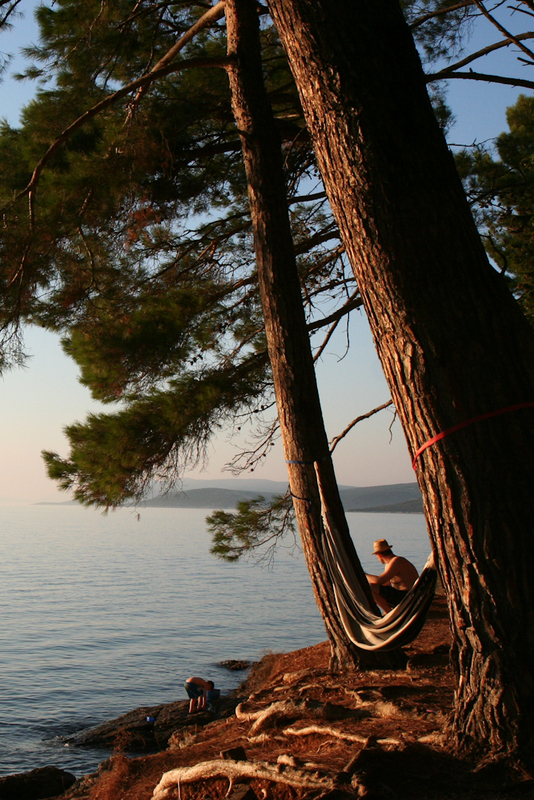 We left the mainland of Croatia to explore one of its many islands. 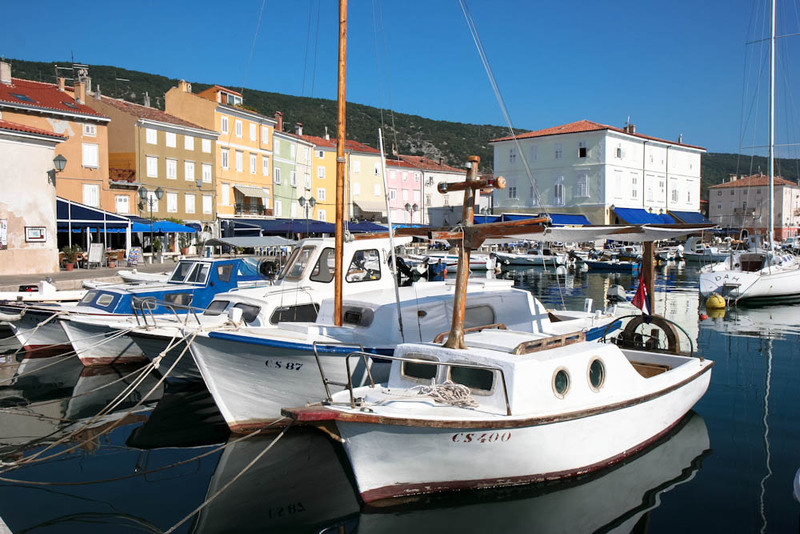 In particular the islands of Cres and Lošinj. Praised for its wild, natural beauty and recommended by two of our friends we were eager to check it out! How to get there? We took the car ferry ‘Jadrolinija’ in Brestova. You can check out the time schedule at www.jadrolinija.hr. There are only 2 ferries going back and forth, so if you missed one, you’ll have to wait 45 minutes for the next one to get back. There is always a huge line in summer, so come early or wait and entertain yourself! Our friend told us about the Eco centre in Beli for griffon vultures. She said it was really amazing to see these big creatures from up close. So the moment we got off the ferry in Porozina, we headed for Beli! The griffon vultures are threatened because there is a serious decline in sheep farming on Cres, which is the bird’s main food source. The reason for the decline in sheep is the importation of wild boar for hunting. And boars eat… sheep. Because we didn’t see a clear sign to where the eco-centre might be and were very hungry, we decided to have lunch first. We asked the waiter for directions to ‘the birds’. Huhu… no more birds?! The lady at the entrance of the exhibition explained that the centre depended on volunteers and they received no funds anymore, so they closed. They are currently negotiating to see if they can open again soon, but before you go, check out first if they have reopened! You can still see the exhibition but we kindly declined the offer. Big bummer. So we were off to our next stop a bit sooner than expected. Suddenly something casted a shadow over our car! We looked out the window and there he/she was! A big griffon vulture above our heads! Too bad we couldn’t stop in the middle of the road, so no pictures as proof. I guess if you linger around the coastal cliffs of Cres + have some patience, you might spot one! Our next stop was Cres town. A lovely small town with a medieval harbour. With a nice store: Macmalić! 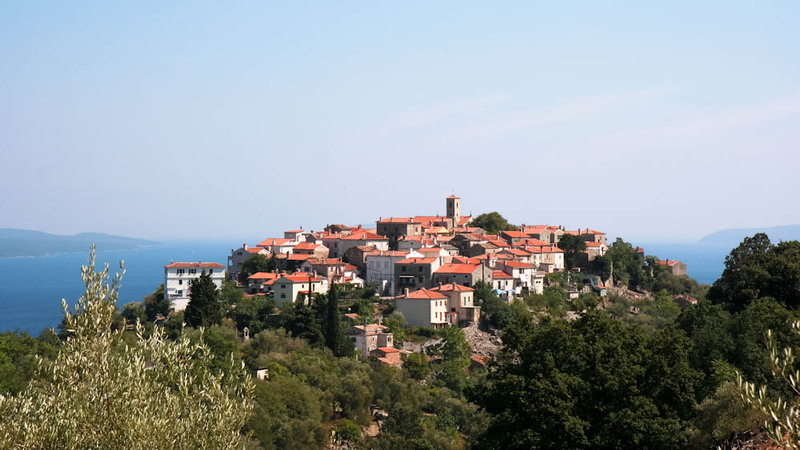 Here is where we got our supply of great Istrian wine, award-winning olive oil, delicious truffle oil and of course some honey grappa! 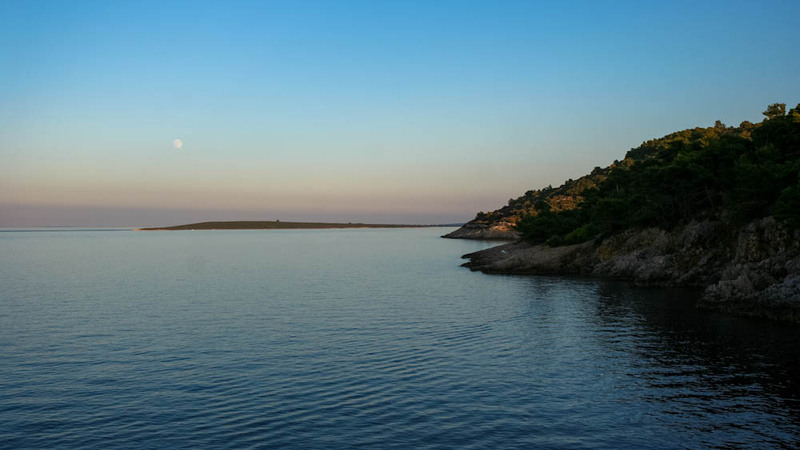 We spend the night at Osor, situated at the narrow channel which divides Cres and Lošinj. It’s very tiny, but there is a camping site! Camp Bijar, one of the most lovely camps we stayed at. It’s very popular, so if you have the chance, make a reservation ahead because some of these spots are to die for! If you didn’t make a reservation, you can look around to see if there is some space left. 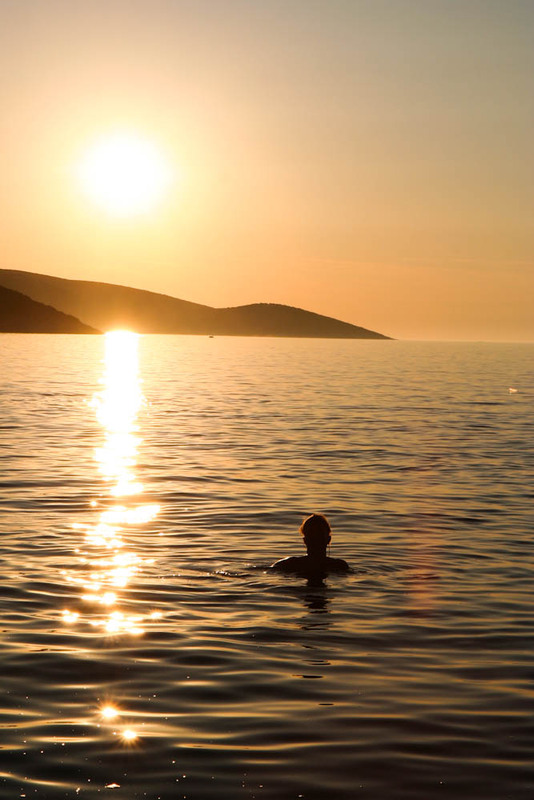 We were enjoying the water while the sun was about to set. Suddenly we realized half of the campers were standing by the water clapping and shouting. We looked everywhere. What? Where? What are they staring at? Then we also spotted them – against the red and purple sky a group of dolphins now and then jumped out of the water! Just like the images that used to hang above my bed when I was little. 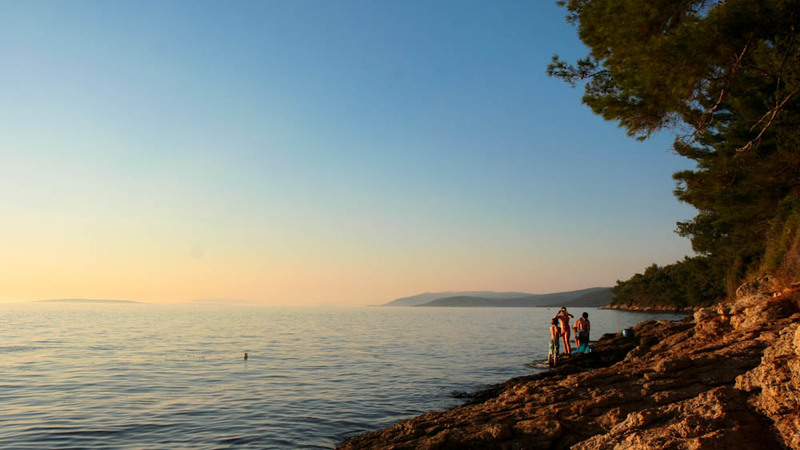 Time to explore Lošinj island! 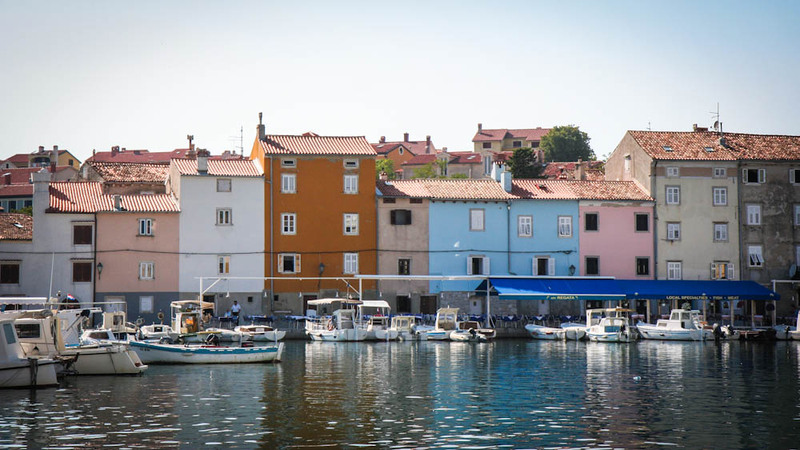 We stopped at beautiful Mali Lošinj to pick up the free brochure ‘Promenades & Footpaths’ at the tourist centre and finally bought a decent diving mask! We followed the sea-promenade along the coves, once in a while stopping to take a dive in that beautiful green-blue water. Since the water is so clear, even with just a diving mask you can already see a lot of the underwater world. It’s important to wear those ‘watershoes’ they sell everywhere, because almost all the beaches are pebble beaches or just rocks. So you’ll have a better grip, and it’s safer in the water as well, which is at some places filled with sea urchins! 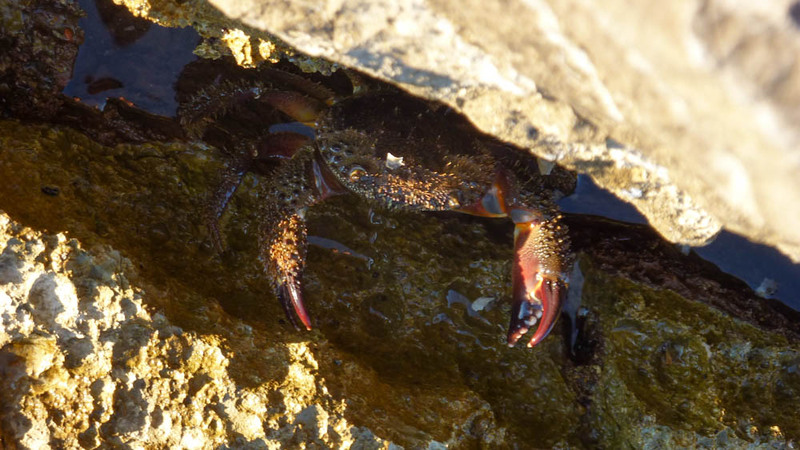 If you look closely, you’ll see numerous of crabs hiding in the cracks of the rocks waiting till it’s dusk to come out. While I was lightly poking a crab to make it come out a little, all of a sudden a big tentacle slipped inside the crack trying to get the crab! The squid was so fast! I was a little reluctant to get back in the water after finding out these squids come so close, I did eventually, but I never saw it again. But we did find a big angry one of these! 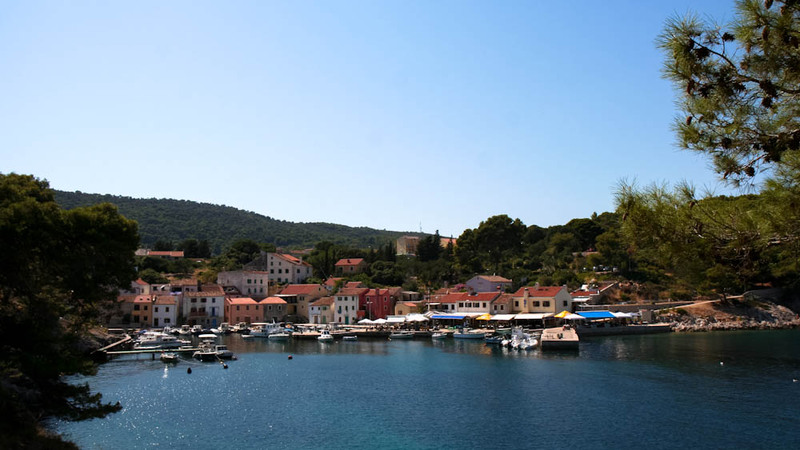 The sea-promenade passes by Veli Lošinj. 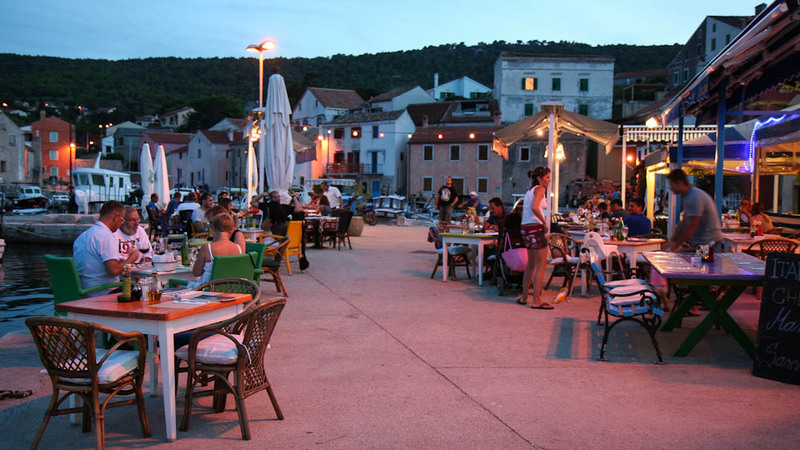 It’s much smaller than Mali Lošinj, but very cosy. A little bit further is Rovenska Bay, where we had dinner by the water at Bora Bar Tartufferia. The owner is the Italian chef, Marco Sasso, who is fond of the Istrian truffle and uses it in many ways, even in the dessert! We can assure you, it was more than good! 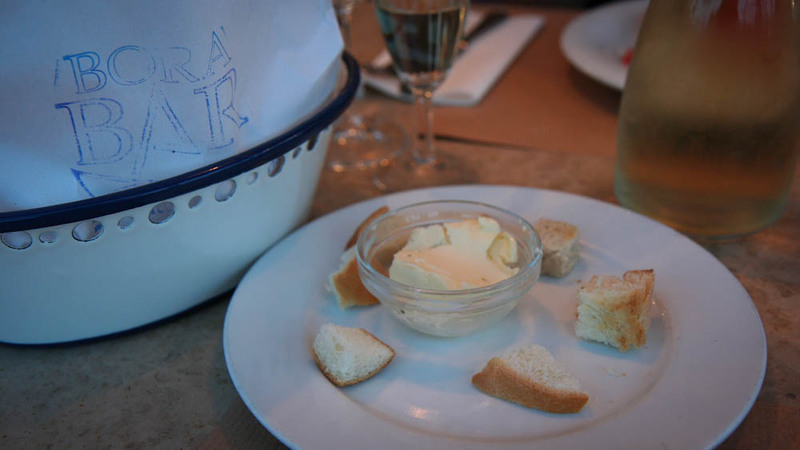 Especially the butter with truffle was heaven! 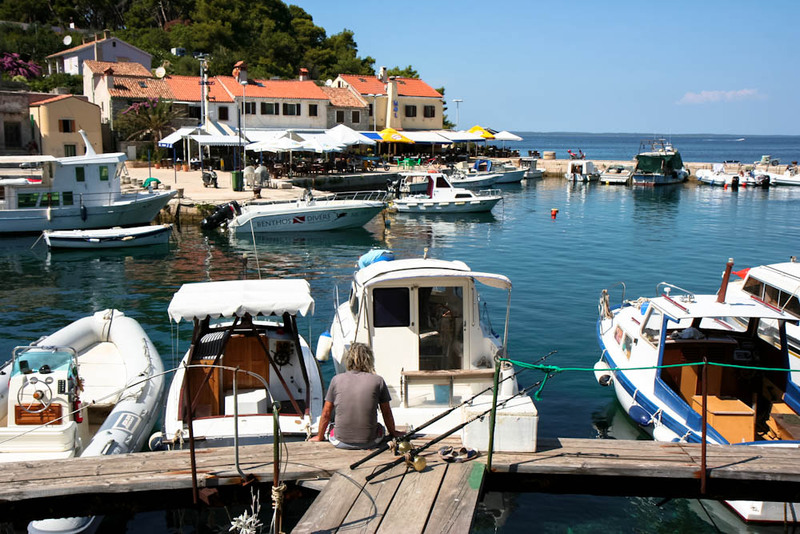 We left the island in Merag, where we took the Jadrolinija again to Valbiska. One important thing: Night rest at Camp Bijar is from 11 p.m. till 6 a.m. The reception desk opens at 7 a.m. but for some reason, you can only pay with credit cards from 8 a.m. So keep this in mind, if you plan to take the early ferry, this makes it kind of impossible!